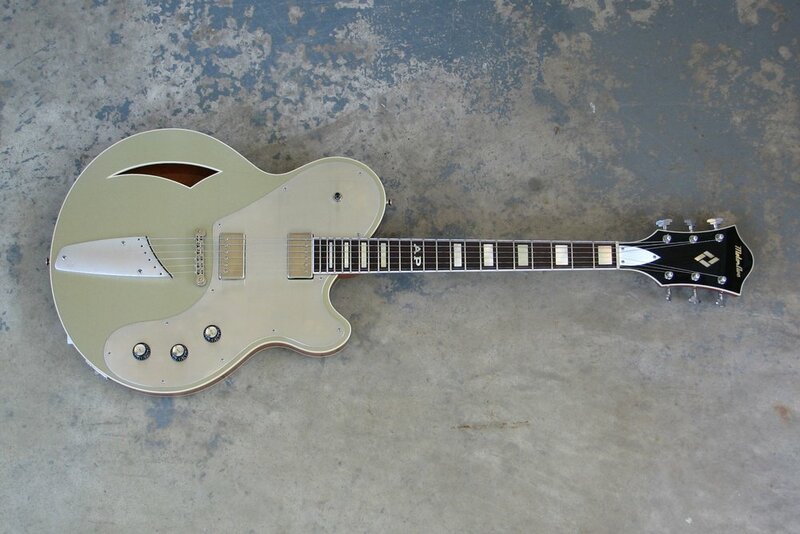 The BelAire is a flat top, semi-hollow guitar. It's the same basic size as a ES-335, except that it has a wider waist. This makes it appear quite large. Average weight is 7.75-8.5 lbs. -MEDIUM FRETWIRE .100” WIDE AND .050” TALL. No matter how you dress it- the MotorAve BelAire sounds huge, and like all of Mark’s guitars... is designed to be played loud. Stylistically, the pick guard is a nod to the thinline telecaster. The F-hole is a sharp reaction to the Rickenbacker cat’s eye. The body is double bound like any self respecting fancy guitar should be. With a Bigsby and Filtertrons, the BelAire may resemble a Gretch (even with your eyes closed). While the BelAire is the same basic size as a 335, they are not constructed in the same way, and for this reason they sound quite different. The variety of inspirations that make up the BelAire have resulted in fairly multipurpose chassis. Out fitted with your choice of tailpiece and pickups, the BelAire lends itself to many styles. But this guitar is no mere Frankenstein... there is also innovation in what may first appear to be tradition. For instance, Mark’s trapeze tailpiece is not hinged to the bottom side of the guitar. It is in fact attached to the center core through the top, by a hook that is then locked into place by a bolt that runs through the end pin and threads into the tip of the hook. As a result, this trapeze does not flop around. On the contrary, it sits suspended above the top and as a result stays in tune beautifully. 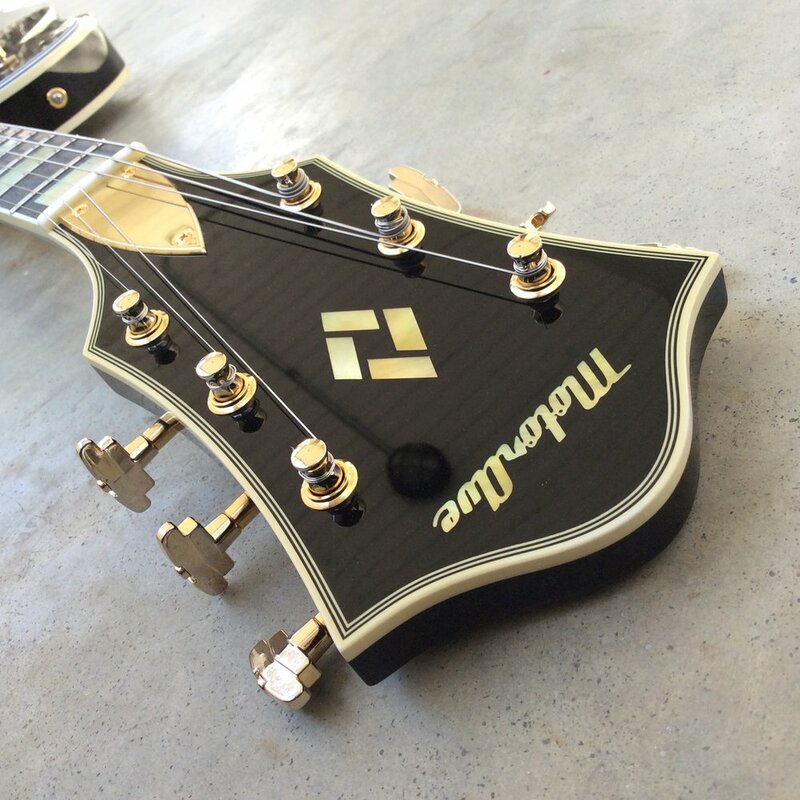 Mark also designed the String Thru tailpiece- which is equal parts form and function. He first put one of these on a guitar as a point of style. Though, it quickly became apparent that this tailpiece “drives” the guitar- giving it a deeper, more resonant growl. The body of a BelAire starts off as a solid core and a book matched back plate. The body is routed to reveal a center block running through the length of the guitar. This block anchors the tail piece, bridge, and pickup; connecting them to the neck via the long tenon that locks the neck into the body. Before the back is glued on, it is finished, sanded, and buffed on the F-hole side; and the rest of the cavities are sealed and shielded as well. This attention to detail runs throughout the entire building and finishing processes. Mark does not let anything slip. In the end, after much time and money has been spent leading up to that moment when you open up the case... our goal is to blow your mind. And if it takes you a few months to get past the shine; all the better!